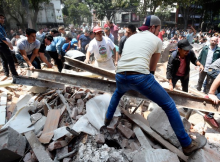 At least 49 dead as strong 7.1 magnitude earthquake hit mexico cityAt least 49 people were reported killed on Tuesday, September 19 as a 7.1 magnitude temblor shook Mexico, causing buildings to tremble and collapse. The disaster coincides with the anniversary of a deadly 1985 earthquake which shook central Mexico. Tuesday’s quake struck at 1:14 p.m. Just hours after a siren signaled an annual earthquake drill in Mexico City, the ground began to shake, walls buckled and residents fled into the streets. There were reports of fires and gas leaks. Several people were pulled alive from rubble in the Mexican capital, but others were feared trapped. Local radio in the city of Cuernavaca, the capital of Morelos located about 35 miles south of Mexico City, also reported that people were pinned beneath collapsed buildings there, according to Reuters. A major highway connecting Cuernavaca to Mexico City also appeared badly damaged, according to photos circulating on social media. The U.S. Geological Survey said the epicenter of the quake was 76 miles southeast of the capital, near the town of Raboso in Puebla. Photos showed collapsed buildings in Mexico City. It also showed emergency workers in yellow hard hats as they scrambled over mountains of debris — twisted metal beams, chunks of plaster and broken glass — where structures had once stood. Cars were nearly buried in rubble. Residents were seen embracing and crying in the streets after they raced out of their homes. At the Clínica Gabriel Mancera in Mexico City, more than a dozen hospital beds had been set up in the patio outside as a triage center for the injured. Leticia Gonzalez, a 45-year-old maid in a nearby apartment building, said that she tried to race out of the building but that concrete crashed down as she fled. Her right leg was wrapped in a bandage as she grimaced in pain outside the hospital. Marisela Avila Gomez, 58, was in her apartment in the central Narvarte neighborhood in the capital when the shaking began, toppling her furniture and shattering the windows. A piece of glass sliced deep into her right leg. The couple eventually made it to the Clinica Gabriel Mancera, where Avila Gomez was treated. Classes were suspended at schools in a large swath of central Mexico. Patients were evacuated from damaged hospitals. The Mexico City airport was closed as authorities looked for damage. In the southern Mexico City neighborhood of Coyoacan, the walls of colonial-era buildings cracked and sagged, with some collapsing into rubble. At the Barricas Don Tiburcio shop, shelves bearing food crashed down and wine bottles shattered on the floors. “This is the worst one I have ever felt,” shopkeeper Beatriz Aguilar Bustamante said.